One of the final pieces of the Howard Smith Wharves puzzle, the highly anticipated and hotly debated Art Series hotel, The Fantauzzo, has finally completed its three-year build, and is officially open to the public. Carved into the cliff face underneath the Story Bridge, this ambitious project solidifies its position as a dining and recreational hub for locals as much as it will become for visitors. The six-storey hotel is unique to Brisbane and is only the second Art Series hotel in the city, after The Johnson in Spring Hill. 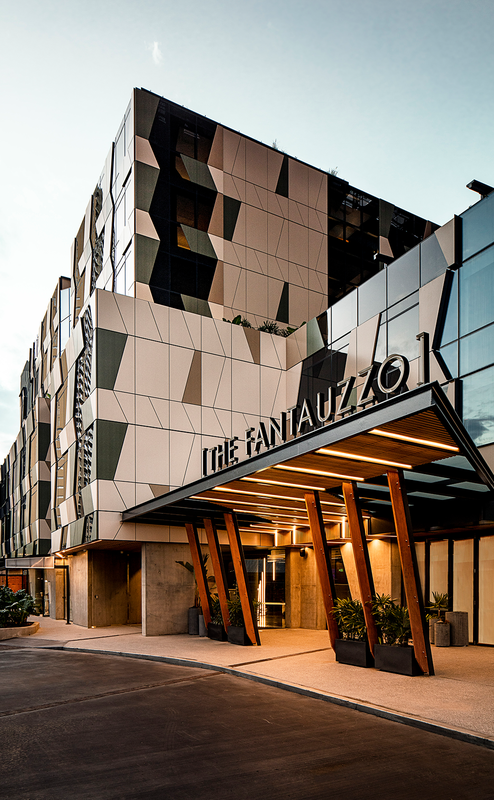 As the new flagship for Queensland The Fantauzzo has had no expense spared; from the location itself to its surrounds in nature, to the architecture of the building, even the collaboration with acclaimed artist Vincent Fantauzzo, from whom the property gets its name, elevates The Fantauzzo to luxury hotel status. Fantauzzo’s award-winning works line the elegant reception area, which features six original pieces, and more than 500 pieces featured throughout the property. The nature and style of Fantauzzo’s hyper-realism discipline and colour palette have heavily influenced the décor and style of the hotel itself; inky blues, ash greys, and mossy greens all tied together with brass and granite accents ties in the rooms and spaces throughout, with room views taking in either aspects of the city and river or the soaring rock face (a calming touch, which makes for very peaceful stay). On the ground floor, Polpetta—the hotel’s signature restaurant—serves up breakfast lunch and dinner to guests and the public, serving up contemporary Italian dishes, Romano-style. One of four food and drink options on the property (more news on these to be announced in the coming weeks, but rumour has it Betty's Burger are locked in) It’s on the third floor, however, where The Fantauzzo really makes its mark in the Brisbane food and beverage scene. Fumé, the hotel’s rooftop bar, resides directly underneath the iconic Story Bridge and boasts uninterrupted views of the city, the river, the boardwalk and the bridge itself, giving off very intended (and very welcomed) slick inner-city vibes. 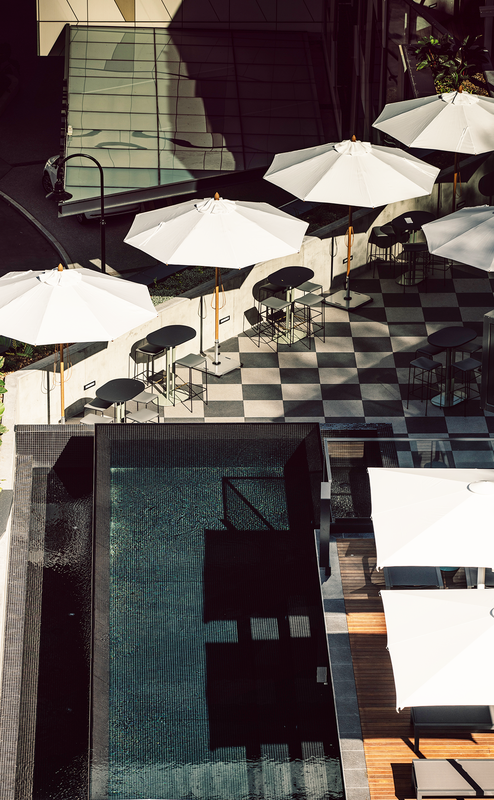 One of only a handful of CBD rooftop bars, the design is slick but unfussy. A timeless-looking bar, one of its many features is the private access lift that will take you straight from the boardwalk to the open-air bar in moments. The best bit? It’s open to the public, not just reserved for guests. It is also here where the rooftop infinity pool and bar is located, also boasting some impressive views of the city, bridge and river. While this little slice of luxury is just for guests, there are plans to make the pool and its amenities available at certain times to the public. It is touches like this that will undoubtedly help the property’s footprint evolve with the growth of the city itself and highlights the thought process behind The Fantauzzo and its commitment to enhancing our city. Open to guests from now, it is perfect for a weekend getaway in the city but also well worth taking your knock-off drinks and dinner plans riverside and check out those jaw-dropping views from the rooftop bar. Make a point to check out The Fauntauzzo (and maybe check yourself in) here.